This month: Continuing our commemoration of the 150th anniversary of Edison's birth with an early concert cylinder recording. 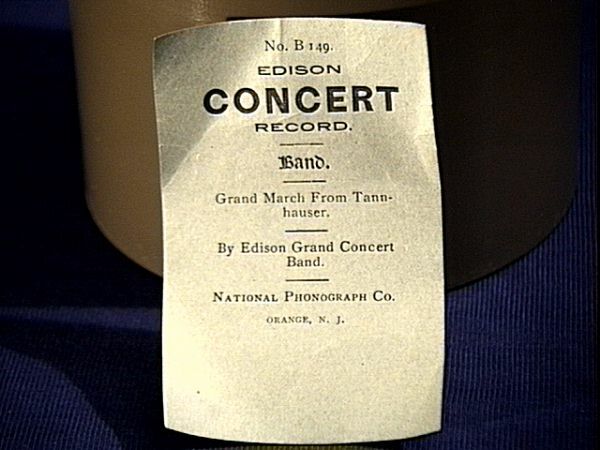 From 1899, the Grand March From Tannhauser, played by the Edison Grand Concert Band. Announcement "Grand March From Tannhauser, played by Edison's Grand Concert Band." This fine example of an early Edison concert cylinder, recorded at 125 RPM, is an original recording, not a pantographic copy of another recording as was common in later concert cylinders from 1900 on. Notice how the announcer is really shouting out the announcement! 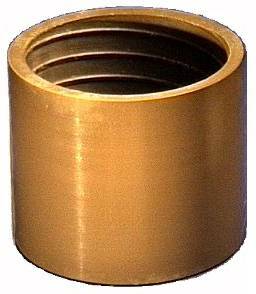 Concert cylinders were large 5" diameter brown wax records sold by both Columbia and Edison records beginning in late 1898. Columbia called them graphophone grand records, while Edison named them simply concert records. Much larger than standard 2-and-1/4" diameter cylinders, concert cylinders could in theory deliver a better recording. Although the early concert cylinder recordings had better sound quality than standard cylinders, the price of a concert was a very high $4 to $5 (compared to 35 to 50 cents for a standard cylinder)! In addition, they were of course very large, taking up a lot of space. Plus, they were infamously fragile. As a result, they did not sell well. While most early concert cylinders were original recordings, producing a clear, loud record, many later concert cylinders were simply pantographic copies of original recordings. Because the pantographic process produced copies with less volume and a "brasher" more distorted sound, this virtually eliminated any advantage concert cylinders had over the smaller standard brown wax cylinders. As concert sales limped on, prices were halved and halved again until by 1904 they were selling for under $1. Although standard cylinders were by then being made by a molding process using black wax, concert cylinders were never molded (except by Lambert Records which manufactured an 'indestructible' celluloid 5" record). Ever faithful to his customers, Edison stuck with concert cylinders until 1912 when he discontinued selling wax cylinders altogether (he continued selling standard-sized 4-minute celluloid cylinders until 1929). 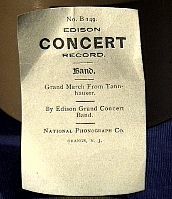 Click here or on the image to see a close-up of the original concert record slip.